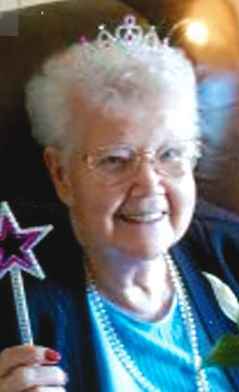 Ruby Elizabeth (Smith) Kapp, residing in Tiffin, Ohio died September 14, aged 97 years, 2 months, and 3 days. The fifth of nine children, Ruby was born July 11, 1920 in Fremont, Ohio to Archie and Esther (Gormley) Smith. She was married November 24, 1938 in Fremont to Blaine C. “Pete” Kapp of Bascom, Ohio and he preceded her in death on June 16, 1997. For many years Ruby served as a research volunteer to the Hayes Presidential Library indexing historical data. She also volunteered at the Sandusky County Kin Hunters and the Sandusky County Senior Center. She loved to knit and crochet and did other crafts. A dedicated Cleveland Indians fan, Ruby followed them enthusiastically. Ruby was the family genealogist whose search spanned decades. She traveled extensively assembling her family tree. She brought the past to life with all of her work. Her meticulously researched notebooks have been donated to the Sandusky City Library and the Hayes Presidential Library. These records are available for use by the public. In her 90’s Ruby began a new career as a poet. Her many writing creations, most dedicated to family, have been assembled in a book given to her by her niece. Her poetry was award winning, not only at the local level, but at the state level as well. Ruby was comforted in her last days with the knowledge that her vast collection of writings and research have been placed in the hands of the next generation for safe keeping. Ruby is survived by daughter Peggy Jones of Medina, OH, grandson Tod Morrison of Chippewa Lake, Ohio, and great grandson Richard Morrison of Texas along with numerous nieces and nephews. She was preceded in death by her husband, her parents, sisters, Dora Cunningham, Helen Witter, Esther Burkett and brothers Charles, Archie, Cletus, Kenneth, and James Smith; son-in-law, James “JT” Jones. Visitation: Monday, September 18, 2017, from 11:00 am until 1:00 pm at Wonderly Horvath Hanes Funeral Home and Crematory, 425 E. State St, Fremont, OH. Services will begin at 1:00 pm at the funeral home with Chaplain Michael Smith officiating.